Former Bulgarian Finance Minister Plamen Oresharski confirmed he is prepared to take up his nomination to be Bulgaria’s next PM if the Bulgarian Socialist Party wins the upcoming May 12 vote. Saturday socialist leader and former Bulgarian PM (2005-9) Sergey Stanishev said that if his party wins, he will propose Oresharski, who served as his FinMin, for Bulgaria’s new cabinet leader. After the February 20 resignation of then-PM Boyko Borisov, Stanishev vowed to lead his party to victory in early elections, but promised he will not seek to become a PM again. “I feel completely prepared – both theoretically and practically – to serve as prime minister,” said Oresharski Sunday. The former Minister of Finance said that although Bulgaria is facing serious problems that cannot be resolved in 4 years, he is resolved to implement significant reforms. “We will work hard, but people cannot expect to get drastically better off in such a short period,” added Oresharski. Borisov resigned in the wake of strong street protests against social and economic stagnation in Bulgaria, but vowed to seek re-election, expressing confidence his center-right GERB party will win the early vote. 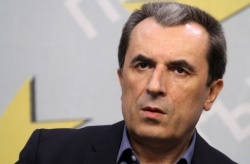 Plamen Oresharski, who also served as Deputy Finance Minister in the rightist cabinet of PM Ivan Kostov (1997-2001), is not a member of the Bulgarian Socialist Party, although he served as MP for the Socialists in Bulgaria’s last parliament. With a strong professional background in finance, Oresharski is seen as an expert figure in Bulgarian politics, but his affiliation with the Bulgarian Socialist Party in the last few years is undisputed.